The Nile River near the confluence of the Blue Nile and White Nile in Khartoum, Sudan. Most of Sudan's major rivers are less than 500 miles in length, and all are shared with other countries. Most are shared with Ethiopia, with the exception of the Barka River, which is shared with Eritrea, and the Bahr al-Arab River, which is shared with South Sudan. But the country is also home to the vast Nile river and two of its primary tributaries. Meandering through eleven countries for a total of 4,258 miles, the Nile is considered by many to be the longest river in the world. It is the primary water source for Sudan. Its two main tributaries, known as the Blue Nile and the White Nile, meet in Khartoum and flow north to Lake Nubia, known as Lake Nasser across the border in Egypt. The White Nile is much longer, originating in central Africa and flowing 2,299 miles through five other countries before flowing through Sudan. The Blue Nile begins in Ethiopia and stretches 901 miles before joining the White Nile. The 500-mile Atbarah, 398-mile Barka, 300-mile Dinder, and 137-mile Angareb rivers are also tributaries of the Nile. The Nile follows a distinctive course through Sudan. It flows over six groups of cataracts between Aswan and Sabaloka, after which follows a southward course before continuing north towards Egypt. The river enters Lake Nubia, known as Lake Nasser in Egypt, as it crosses the border of Sudan. Rising out of the Great Lakes region of equatorial Africa, the White Nile is considered to be the headwaters of the Nile River, contributing between 70% and 90% of the river's total discharge during the dry season. Its most distant source is as yet undetermined, but is believed to be located in either Burundi or Rwanda, and flows northward through Tanzania, Lake Victoria, Uganda and South Sudan before joining the Blue Nile in Khartoum. The Blue Nile begins in Ethiopia's Lake Tana, and flows into Sudan from the southeast. It gets its name from the vast quantities of silt, carried in from the Ethiopian highlands which colors the water dark brown or almost black. During the rainy season, water from the Blue Nile comprises over two thirds of the Nile River's total output. The Atbarah river is named for the city near the point where it meets the Nile river. It is the last tributary of the Nile before it reaches the Mediterranean. Civilizations in Egypt and Sudan have relied on the Nile as a water source and transportation artery since ancient times. Although it is not mentioned by its modern name, the Nile is believed to have been referred to numerous times in the bible, and the Blue Nile is believed by some to be the river Gihon, mentioned in Genesis. Other than the Nile River and its two major tributaries, Sudan's rivers tend to be seasonal. Many are dry or little more than streams for much of the year, but become raging torrents and are subject to sudden flooding during the rainy season. Sudan's Dinder National Park, stretching south from the Dinder river, was meant to protect the endangered painted hunting dog, Lycaon pictus. However, the animal is now thought to be exterminated in the region. 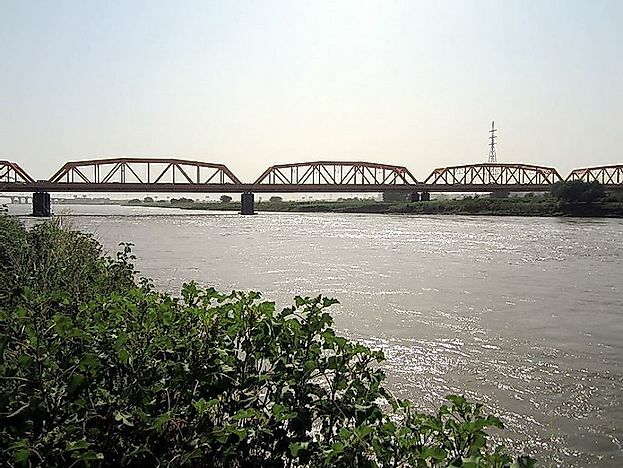 The Bahr al-Arab River has marked the boundary between the Dinka and Baggara ethnic groups along the border between northern and southern Sudan for as long as oral traditions can recount. During the Second Sudanese Civil War the river's location made it a contested boundary and military front. The Atbarah River was the site of a major battle fought in April of 1898 between forces of the Khalifa of Sudan and the British Empire.